"There is so much wisdom in this heartfelt, moving, and deeply personal book"
In 1997, Timothy McCall, MD left a successful medical career to become a yoga therapist. Twenty years later, diagnosed with metastatic cancer, he returned his focus to the practice of medicine, this time as a patient. He would need all he had learned in both healing worlds…. "Wearing only a muslin loincloth, I lie on a hardwood table. Its legs are still the original color, but the surface is stained dark from years of oil massages. A warm breeze stirs the sun-bleached crimson sari that separates the treatment room from the garden and the coconut palms outside." "Conventional medicine handles disease the way conventional agriculture handles crop pests: excise and poison the invaders until they’ve been killed off. Holistic medicine, on the other hand, resembles organic gardening: nurture the soil in which your plants grow, and your plants will be healthy. I’m using both of these approaches: the cancer is being dosed with toxic chemicals and radiation, while the soil of my body is cared for with healthy whole foods, deep relaxation, and herbs." yogis alike. It's for healthcare professionals, holistic healers and those facing health challenges — and anyone who loves a good story. "A masterpiece written from the heart." The full-color Hardcover will be released May 2nd, 2019 by Whole World Publishing. The hardcover will be available on Amazon, but we'll be offering it directly to you as well. You can get it for half price if you buy a case of 10 and order by May 2nd with free shipping anywhere in the US. Details coming soon. 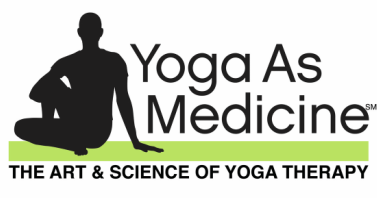 Dr. Timothy McCall's career has included three phases: practicing internal medicine, advising and advocating for health care consumers and exploring yoga and holistic healing. To survive the next phase — metastatic head and neck cancer — he would need all he'd learned, plus the wealth of information he uncovered before, during and after cancer treatments that, again and again, allowed him to refine his approach. 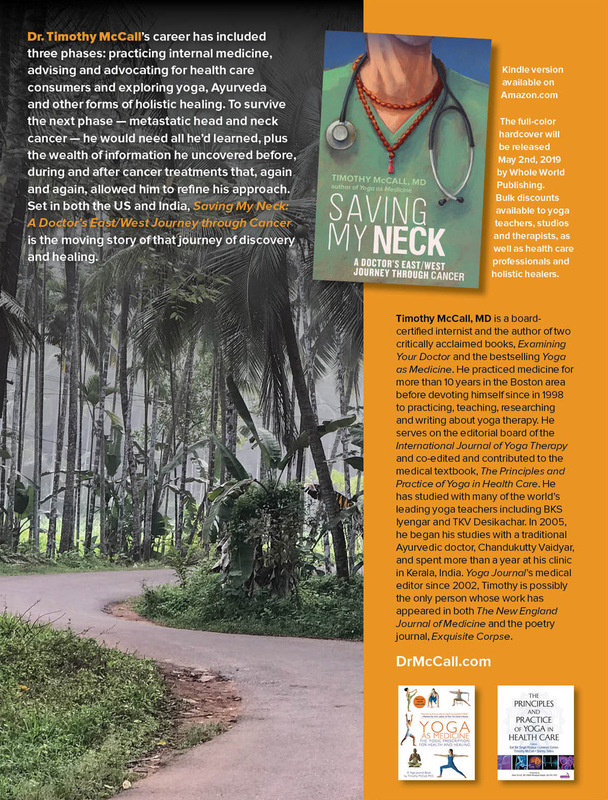 Set in both the U.S. and India, Saving My Neck: A Doctor's East/West Journey through Cancer is the moving story of that journey of discovery and healing. 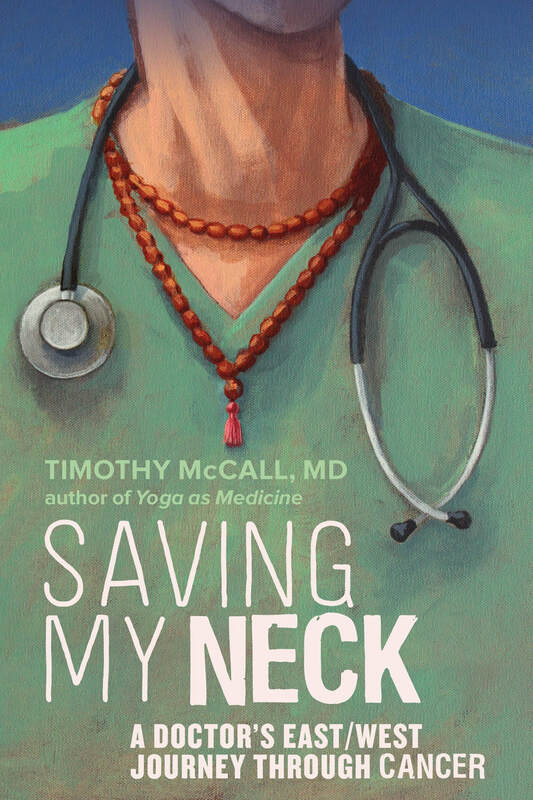 In part a memoir, in part a meditation on science and holistic healing, Saving My Neck is my most personal, and I believe most important book. Please help spread the word. Here's a link to a jpg of a downloadable flier about the book, which we humbly ask you to share with anyone you think might be interested. For a higher resolution PDF, suitable for printing, click here. Thank you! "There is so much wisdom in this heartfelt, moving, and deeply personal book. Dr. Timothy McCall takes us on a colorful journey from South India through the halls of American hospitals. He deftly describes how he wove together the best of conventional and complementary medicine into a treatment plan that was both safe and effective." "In this engaging memoir, Dr. Timothy McCall shows how he combined state-of-the-art scientific medicine with a variety of holistic healing tools, in order to address the many aspects of body, mind and spirit that modern medicine tends to neglect. This kind of integrative approach is the future of health care, and as this book deftly illustrates, it can be the present, too." Mark Hyman, MD, Director, Cleveland Clinic Center for Functional Medicine and #1 New York Times bestselling author, Food: What the Heck Should I Eat? – Dr. John Douillard, DC CAP, bestselling author and founder of LifeSpa.com, which has over 8 million YouTube views and 100k+ newsletter subscribers. "Authoritative, compelling, and down-to-earth, Saving My Neck is also surprisingly relatable, even if one shares neither Dr. McCall's background, diagnosis or prognosis, because it helps us more deftly explore and navigate our own experiences with health, patient advocacy, medicine and mortality. I love this book, have highlighted many full pages of it, and expect to recommend it to many." 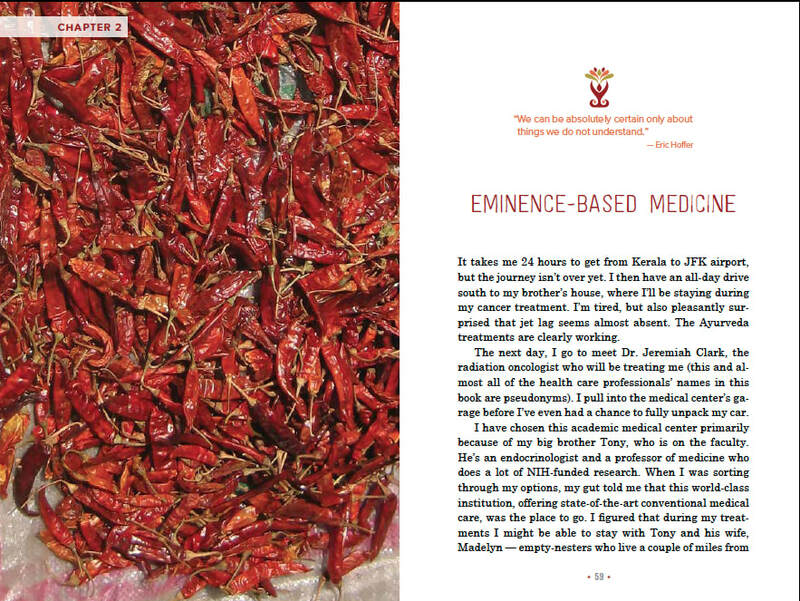 ​"A moving personal testimony to the wisdom and effectiveness of a holistic approach to cancer. As he achieves physical well-being and deeper self-knowledge, Timothy McCall, a distinguished physician-yogi, provides an inspiring example and guidance for all of us who may deal with the challenge of cancer." – James S. Gordon, MD, author of Unstuck: Your Guide to the Seven-Stage Journey Out of Depression, and Founder and Executive Director of The Center for Mind-Body Medicine. "This is the first book I would give a friend recently diagnosed with cancer, IF my friend was open to both conventional and traditional healing methods – such as Yoga, Ayurveda and Traditional Chinese Medicine ­– AND, most importantly, willing to be an active participant in his or her own healthcare. If so, this is a wonderfully inspiring and educational resource. For traditional healing practitioners and researchers, this book is also an excellent education into why Evidence-Based Medicine does not appropriately or fairly evaluate those methods."